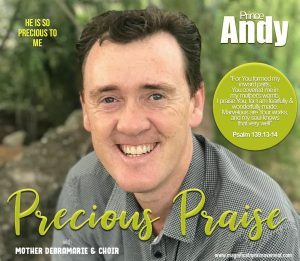 CLICK HERE OR ON THE IMAGE BELOW TO PURCHASE YOUR COPY OF PRECIOUS PRAISE – with our Precious man himself, PRINCE ANDY WITH MOTHER DEBRAMARIE & MMM CHOIR FOR $9.99. This will keep U hopping and dancing with joy 4 Christ in His Victory. U also aid our funding with these lovely CDs so thanks for that too. Certainly a great gift to give out also with your generous blessings of true joy 4 Christ. Be precious wherever U are & especially let your joy in Christ bless many who U meet each day. Christ is MOVING with U dear saints so praise louder. 2018 has been a wonderful year of favour 4 U so let it magnify out more thru’ U & prince of hearts Andy.